Responding to concerns about staffing shortages at Kansas prisons, Gov. 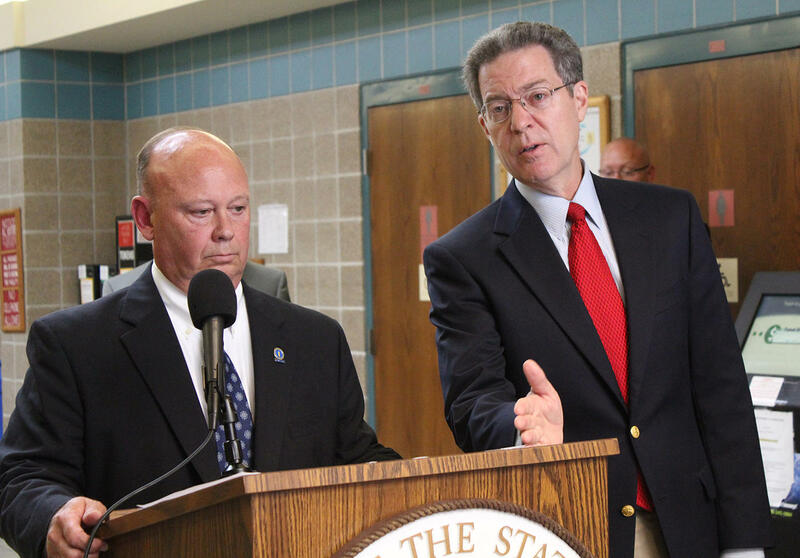 Sam Brownback on Thursday announced pay increases for corrections officers. At left is Joe Norwood, corrections secretary. All uniformed staff making less than the newly established hiring rates will have their pay increased to the new rates. Recent incidents of inmate unrest at El Dorado and other prisons in the system have raised concerns about staffing shortages. Brownback said pay increase was a first step toward making pay competitive in an effort to retain experienced officers at the state’s correctional facilities. “This job is an exceptionally difficult one, and the state appreciates their sacrifices,” Brownback said in a news release. The raises are temporary — for the current budget year — and the Kansas Legislature will decide in its next session whether to extend them. “Addressing recruitment and retention will require commitment from the Legislature, and I encourage them to work with the Department of Corrections in the 2018 legislation session,” Brownback said.